India has an untapped potential for further growth in trade, and consequently opportunities in the shipping and port sector. The shipping and dry bulk commodity trade has been hit greatly by the slowdown in the Chinese economy and the world economy in general, but there is still scope for growth as approximately 95 per cent of trade by volume is via the maritime route. India is dependent on importing coal from countries such as Indonesia, Australia and South Africa for its thermal power plants, which account for the bulk of the energy produced in India. During the past ten years or so, Indian companies have routinely been investing in mines abroad. Preliminary data from the International Energy Agency indicates that India may even overtake China as the largest importer of coal. However, the Indian government plans to cut coal imports and rely on domestic production for power generation in the coming years. According to the World Steel Association, India is the only country in the world that has shown a positive increase in steel production despite steel prices plummeting globally. This will correspondingly lead to further imports in steel-making coking coal. A majority of Indian petrochemical companies that import crude oil from Africa and the Middle East are government-owned. Indian oil refiners have sought to increase their uptake of Iranian crude since the lifting of a range of European Union and United Nations sanctions in January 2016, and given the geographical proximity. The Jamnagar refinery in western India, which is operated by Reliance Industries, is the world’s largest oil refining complex and exports gasoline and diesel to the United States and Europe on large tankers, capturing much of the ex-Asia product tanker trade. As a general practice, Indian government-owned petrochemical companies float tenders (open to foreign shipowners) for the chartering of ships to carry crude oil, and the contracts provide for Indian law and jurisdiction. Indian shipping companies operating in the spot tanker market made huge profits in 2015. As the price of crude oil went down, the refining margins expanded all over the globe. This led to higher utilisation and throughputs by the refineries and, as a consequence, better use of the product tanker fleet. Taking advantage of the fall in global crude oil prices, the Indian government sought to fill strategic petroleum reserves with cheap oil at a rock-bottom prices, thus further pushing demand for tankers calling at various Indian ports. Indian ports are classified as either ‘major ports’ and ‘minor ports’. Major ports are owned and operated by the Indian federal government, while minor ports are owned and operated by various state governments. To date, India has 12 major ports and more than 200 minor ports. The state governments of Gujarat, Maharashtra and Tamil Nadu have enacted legislation to set up autonomous maritime boards that own and operate ports and formulate parameters for the collection of tariffs in their respective states. The Tariff Authority for the Major Ports (TAMP) is a regulatory body, or quasi-judicial authority, that deals with the levy of port tariffs such as berthing charges and anchorage charges on ships. The legal basis of TAMP can be found in the Major Port Trusts Act 1963 (Chapter VA). TAMP is the economic regulator (solely) for the major ports and is charged with fixing and revising tariffs, including those of privately owned terminals. It also has powers to control the efficiency of port and terminal services in the major ports. Unfortunately there is no regulatory authority along these lines for minor ports. There are litigations before Indian courts in which foreign shipowners have challenged the arbitrary and monopolistic fixing of tariffs by private terminal operators against foreign shipowners. The drafts at major ports have been historically low in comparison to required drafts for the sizes and shapes of ships in use today. The average draft in most Indian ports ranges between 12 and 14 metres, which makes it difficult to handle new-generation container vessels exceeding 15,000 twenty-foot equivalent units (TEUs) or super tankers. There has been steady progress in ancillary industries, such as dredging, with foreign players being allowed to bid for lucrative tenders subject to the ‘right of first refusal’ of Indian dredging companies. Around 25 per cent of India’s container cargo is transshipped through international transshipment ports such as Colombo and Singapore because of the lack of infrastructure to handle larger vessels at Indian ports. The International Container Transshipment Terminal at Vallarpadam has already surpassed its estimated annual throughput of 400,000 TEUs and handled more than 556,000 TEUs in 2017. Under its Sagarmala initiative, the Indian government has identified more than 150 projects for development of its port infrastructure and is seeking, inter alia, to focus on port modernisation and port-led industrialisation. While India allows 100 per cent foreign direct investment in the shipping sector, there have been very few global players who have sought to invest and flag their vessels in India. Ninety per cent of India’s foreign trade by volume is carried by foreign-flagged ships. The Indian taxation regime has generally not been considered to be favourable for foreign investors in the Indian shipping industry in comparison with other jurisdictions, such as Singaporean and Dubai, along with other open registries, such as Liberia, Panama and the Marshall Islands. Keeping these issues in mind, the Indian government launched the ‘Come Flag in India’ campaign in 2016 to attract foreign shipowners to reflag their vessels with the Indian flag by granting exemptions on payment of customs and exercise duties on bunkers and monetary incentives at 3,000 rupees per TEU for the transport of containerised cargo on Indian-flagged vessels on local routes. Foreign container-shipping companies have availed schemes under the ‘Come Flag in India’ campaign by reflagging their vessels with the Indian flag to take advantage of opportunities in coastal trade in India. Shipping in India is centrally regulated and exclusively controlled by the Ministry of Shipping. The Directorate General of Shipping (DG Shipping) is a statutory authority constituted under the Indian Merchant Shipping Act 1958 (MSA) to deal with all matters relating to shipping policy and legislation, implementation of various international conventions and other mandatory regulations of the International Maritime Organisation. The DG Shipping routinely issues circulars and notifications regulating shipping in India. The Mercantile Maritime Department is a body under the control of the DG Shipping dealing with the registration of Indian-flagged vessels, survey of ships and enforcement of international regulations such as SOLAS and the Load Line Conventions. The Ministry of Shipping has a chartering wing (Transchart) to broker transportation of government-owned and government-controlled cargoes. Transchart makes shipping arrangements at internationally competitive freight rates while giving preference and support to Indian-flagged vessels without any difference in freight rate, at a service charge of 1 per cent. Transchart regularly finalises long-term time charterparties, contracts of affreightment for various Indian government-owned entities, such as the Steel Authority of India, Rashtriya Ispat Nigam Ltd and the Department of Fertilizers. There have been instances where vessels have been detained for their failure to provide proper declaration. The carriage of arms and ammunition has posed added complications for vessels calling into an Indian port following the incident with the MV Seaman Guard Ohio. While guidelines issued by the Ministry of Shipping are clear on the formalities required to carry arms and ammunition on board a vessel before calling into an Indian port, there remains ambiguity on the rights of foreign-flagged vessels to carry arms and ammunition while entering India’s economic exclusive zone and territorial waters. The Madurai Bench of the Madras High Court2 exonerated 35 foreign seafarers on the MV Seaman Guard Ohio, a foreign-flagged floating armoury, who had been imprisoned in India for entering Indian waters. Generally, an Indian shipping company would have to pay corporate tax at the rate of 33.3 per cent, unless it opted for the tonnage tax system, which is between 1 per cent and 2 per cent of its income. An Indian shipping company could opt for the tonnage tax system by fulfilling certain guidelines laid down by the government, such as the training of Indian seafarers and making financial provision for new vessel ownership. The Indian indirect tax regime has undergone a radical overhaul with the enactment of the Goods and Services Tax Act, 2017. The Indian government has issued an amendment through its latest notification, No. 2/2018-Central Tax (Rate), stating that the export of ocean freight will be exempted from goods and services tax, effective from 25 January 2018 with a ‘sunset clause’ up to 30 September 2018 (i.e., the exemption will automatically be terminated after this fixed period). There have been incidents in which foreign crew members were arrested for using satellite phones, such as Thuraya, within Indian territorial waters. The use of satellite phones, such as Thuraya and Iridium, is banned in India by the DG Shipping.3 Even if a foreign-flagged vessel possesses all the valid documents permitting her to carry satellite phones, the Indian authorities has the right to deny permission to use them. These satellite phones can be used only after a ‘no objection certificate’ is obtained from the Department of Telecommunications. Unauthorised holders or users of Thuraya and Iridium satellite devices can be prosecuted under Section 6 of Indian Wireless Telegraphy Act 1933 and Section 20 of the Indian Telegraph Act 1885, read with the relevant provision under the Indian Penal Code 1860. The MSA sets out cabotage regulations that restrict the use of foreign-flagged vessels for transporting cargo between ports within India. Indian charterers must obtain permission from the DG Shipping before chartering a foreign-flagged vessel for the transportation of cargo.4 Indian charterers are required to circulate an enquiry with the Indian National Shipowners Association (INSA) to exhaust the Indian tonnage, and only after obtaining a no-objection certificate from INSA may an Indian charterer charter a foreign-flagged vessel. The Indian government amended the cabotage policy in 2016 to promote transshipment. Indian owners are now permitted to own foreign-flagged vessels subject to having adequate Indian-flagged vessels in their fleet, and these foreign-flagged vessels would then be classed as ‘Indian-controlled vessels’ and receive a licence under Section 406 permitting them to do coastal trade. However, in any tender bids, the Indian-controlled tonnage would still be considered only after an Indian-flagged vessel. Further, the Indian owner would have to comply with certain conditions, such as the employment of a minimum number of Indian crew. The Indian government has dispensed with the requirement for a licence5 under Section 407 of the MSA for coastal trade by a foreign-flagged vessel, if the vessel is calling in a specially designated transshipment port and carrying EXIM cargo (cargo especially for export and import) or empty TEU containers. It appears that the idea is to promote transshipment terminals in India, such as the Vallarpadam and Vizhinjam transshipment terminals. There is, however, a general call for further relaxation of the cabotage regime in India. Commercial disputes in India are litigated primarily in civil courts or the High Court of a coastal state in the exercise of its admiralty jurisdiction. For general suits, the High Courts of Bombay, Calcutta, Delhi, Madras and Himachal Pradesh exercise original jurisdiction for claims that have arisen within their territorial and pecuniary jurisdiction, while all other civil suits have to be instituted in the courts of first instance, which invariably are the district courts. However, the admiralty jurisdiction is vested only with the High Court of that particular coastal state. Under the newly enacted admiralty regime, each High Court of a given state can only exercise admiralty jurisdiction over vessels calling at their respective coastal state. The enactment of the Commercial Courts, Commercial Division and Commercial Appellate Division of High Courts Act 2015 (the Commercial Courts Act) radically upgraded the existing judicial procedural framework. The government has established special commercial courts modelled on the lines of the English High Court to deal exclusively with ‘commercial disputes’ involving specialised subject matter (i.e., relating to export or admiralty and maritime law, carriage of goods, import of merchandise, sale of goods, insurance, etc.). The Commercial Courts Act imposes fixed and strict deadlines to complete procedural formalities. It seeks to impose a duty of full and frank disclosure of facts and documents at the time of filing the claim statement and defence and gives the court greater power to compel parties to disclose documents. In keeping with the latest developments in technology, the Commercial Courts Act has introduced the system of e-discovery of electronic records, such as metadata and logs relating to the creation and modification of documents. It also introduces a regime that now makes legal costs recoverable. Under the new regime, it is incumbent on the court to award legal costs after disposal of the suit and the judge must set out reasons why legal costs have not been awarded. Even though the regime now allows recovery of costs, the courts have, to date, largely not been inclined to issue orders awarding costs, if at all, at figures that equate to the total costs actually incurred by a party. Words such as ‘alone’, ‘only’ or ‘exclusive’ are not required to render a clause as an exclusive jurisdiction clause under Indian law.6 If a contract provides for parties to submit to the jurisdiction of a particular court, there is a general presumption that the intention of the parties would be to exclude the jurisdiction of all other courts. Limitation being an issue of the lex fori, the Indian Limitation Act 1963 will mandatorily apply to disputes litigated in India. For most types of cause of action, the limitation period under Indian law is three years. Maritime arbitrations in India may be ad hoc or institutional arbitration with bodies such as the Indian Council of Arbitration (ICA). It is common for shipping contracts involving Indian government-owned companies to provide for arbitration in India to be administered by the ICA under its Maritime Arbitration Rules. India has given effect to the UNCITRAL Model Law on International Commercial Arbitration through the Arbitration and Conciliation Act 1996 (the Arbitration Act). The Arbitration Act was last amended in 2015, ushering in what is essentially a new arbitration regime following the amendment. The default court to move any application with respect to an international commercial arbitration (where one of the parties is a foreign party irrespective of whether the arbitration is taking place in India or not) would be a High Court. Indian High Courts are better equipped to deal with complex commercial disputes of international transactions, and the official language of High Courts in India is English. This brings an end to a rather notorious dilatory tactic adopted by certain litigants to initiate proceedings in courts in interior parts of India where the proceedings may be in a language other than English and the judge is ill-equipped to handle complex international commercial disputes. The Arbitration Act also empowers Indian courts to pass interim orders for security and other ancillary relief in support of arbitration taking place outside India. Another notable feature is allowing ‘any person claiming through or under’ a party who was a signatory of the original arbitration agreement to be party to the arbitration agreement. This has the effect of binding even an assignee or subrogate within the ambit of the arbitration agreement contained in the underlying contract. The Act requires an arbitrator to disclose in writing any circumstances relating to his or her impartiality and independence, and contains an exhaustive list14 of grounds, including direct, indirect, past and present relationship with the subject matter or parties or counsels to the dispute, be it financial, business, professional, personal, and so on. Furthermore, there is a mandate imposed upon an arbitrator to dispose the reference within one year and in certain limited circumstances extend the reference by a further period of six months. The Arbitration Act, following the amendment, has introduced fast-track arbitration, or document-only arbitration (with the consent of both parties), which, inter alia, entails that the tribunal would consist only of a sole arbitrator, the award being passed by the tribunal merely by reviewing documents without an oral hearing and the arbitrator being under obligation to pass and publish its award within six months of its reference. Under the Arbitration Act, the fact that the award debtor has filed an application to challenge or set aside the award, does not in itself amount to a stay on the execution of the award by the award holder.15 To obtain a stay on execution, the award debtor would need to file a separate application for such a stay under Section 36(3) of the Arbitration Act. As a general rule, a court would pass an order staying the execution of the award, conditional on the party seeking the stay furnishing security for 50 per cent of the value of the award. In an interesting judgment in 2017,19 the Delhi High Court, in its interpretation of the Chloro judgment, followed the proposition of law laid down by the Singapore High Court in the case of Aloe Vera of America, Inc. v. Asianic Food (S) Pte. Ltd20 and held that the arbitral tribunal would, in principle, have jurisdiction to decide on issues whether it should disregard the corporate and juridical personality of a company to hold a non-signatory to an arbitration agreement bound by the arbitration agreement. The Division Bench of the Delhi High Court, in its judgment of Shakti Nath v. Alpha Tiger Cyprus Investment No. 3 Ltd,21 upheld the findings of the court of first instance, which upheld the legal costs awarded by the arbitral tribunal in excess of US$1 million. In July 2017, the Indian government set up a High Level Committee to review the Institutionalisation of Arbitration Mechanism in India, under the chairmanship of Justice (Retd) BNSrikrishna (a former judge of the Supreme Court of India) (Srikrishna Committee), which has proposed creating an impetus to institutional arbitration over ad hoc arbitrations. The Indian Arbitration Act has been arbitration-agnostic, with no provisions specifically geared towards promoting institutional arbitration. There is a recommendation to set up an autonomous body styled as the Arbitration Promotion Council of India to grade various arbitral institutions in India, and to establish a body on the lines of the Chartered Institute of Arbitrators for the accreditation of arbitrators. such evidence as may be necessary to prove that the award is a foreign award. In this regard, an affidavit from a lawyer from the country in which the foreign award was passed stating that the foreign award is final and binding as a matter of the laws in that jurisdiction and confirming that there is no appeal against the award pending in that jurisdiction. The award debtor can resist the enforcement of the foreign award on the grounds of objection enumerated in the New York Convention, which are reproduced under Section 48 of the Arbitration Act. One such commonly used ground was on the issue of public policy, where the award debtor would seek to reargue the underlying issues on merits, and there were a plethora of cases in which the courts considered the merits. However, there were two landmark judgments of the Supreme Court in 2015, 24 in which the scope of public policy was clarified. Subsequently, this was included as an amendment to Section 48 of the Arbitration Act to include an explanation that clarified that ‘for the avoidance of doubt, the test as to whether there is a contravention with the fundamental policy of Indian Law shall not entail a review on the merits of the dispute’. Hence, the courts have been more restrictive in allowing the reopening of any issues on merits. A foreign judgment can only be enforced in India as if it were a decree of an Indian court if it has been passed in a reciprocating territory declared by the Indian government.27 Notably, only a foreign ‘decree’ (i.e., a final judgment on the underlying merits of the case) can be enforced in India and not an interim order. Courts in India have the right to examine whether a foreign judgment has been given on the merits.28 In these circumstances, it would appear that interim or interlocutory orders of freezing or Mareva injunctions passed by foreign courts are not enforceable in India. While the Gujarat High Court in the case of MV Cape Climber v. Glory Wealth Shipping Pvt Ltd 29 has allowed the enforcement of a London arbitral award that has subsequently been converted into a judgment of an English High Court as a decree of the English High Court, the Delhi High Court, in the case of Marina World Shipping Corporation Ltd v. Jindal Exports & Imports Private Ltd,30 rejected this approach and held that a London arbitral award can only be enforced in India under the Arbitration Act and not as an English judgment under the Code of Civil Procedure 1908 (CPC), albeit the London arbitral award had been converted into a judgment of the English High Court. The Bombay High Court in the case of Marine Geotechnic LLC (‘Marine’) v. Costal Marine Construction & Engineering Ltd 31 held that a foreign judgment could in principle be directly enforced in India by way of bankruptcy or winding-up proceedings strictly subject to the decree holder establishing that the foreign decree satisfies the requirements of Section 13 of the CPC. The shipbuilding industry is subject to a plethora of taxes ranging from VAT, central sales tax (CST), excise duty, octroi, customs duty, customs bonds, cost clearing and forwarding excise, foreign income tax, and taxes by ancillary units and subcontractors. Octroi, CST, VAT and service tax at 12.36 per cent is applicable on all design and engineering services procured by the shipyards during the course of ship construction. It is important to ensure that any shipbuilding contract with an Indian counterparty to be governed by Indian law and jurisdiction has clear demarcations of the liability on each party, for the payment of taxes imposed by the Indian authorities. The following are the legislation and principles of law applicable to contracts of carriage. The Indian Carriage of Goods by Sea Act 1925 (the Indian COGSA), in its Schedule, incorporates the Hague Rules. In 1993, India amended the COGSA and included certain provisions of the Hague-Visby Rules. Significantly, the legislation increased the limits as prescribed in the Hague-Visby Rules. However, the Hague-Visby Rules do not, in themselves, have the force of law in India. The Indian COGSA is applicable to outward cargo (i.e., ships carrying goods from Indian ports to foreign ports or between ports in India) and does not apply to inward cargo (i.e., ships carrying goods from foreign ports to Indian ports). In the case of Shipping Corporation of India Ltd v. Bharat Earth Movers Ltd, 35 the Supreme Court of India had to determine whether the Indian COGSA or the Japanese Carriage of Goods by Sea Act 1992 (the Japanese COGSA) applied in a case involving goods carried from Japan to India. The Court held that the Indian COGSA did not apply to inward shipments and chose to apply the Japanese COGSA. Indian courts have allowed carriers to take defences enumerated under Article IV of the Hague Rules (e.g., fire).36 The Multimodal Transport Act 1993 applies to multimodal transportation of cargo from any place in India to a place outside India using two or more modes of transport. Charterparty contracts are governed by the Indian Contract Act 1872 and common law principles derived from various jurisdictions. This is the position in the absence of any provision in the contract whereby a different substantive law applies to the contract. Liens can be exercised under Indian law in the following circumstances. If cargo is to be discharged at a port designated as a major port, a shipowner may be able to exercise a statutory lien over the cargo shipped on board the vessel for claims of outstanding freight and other charges payable to the shipowner.38 Certain ports in the ownership of the state government, such as Gujarat, have similar provisions enabling a shipowner to exercise a statutory lien over the cargo.39 Notice of such a lien must be served upon the consignee and the concerned port authority prior to the discharge of the cargo from the vessel. Other than the right of lien under the Major Port Trust Act 1963, the question of whether an owner has the right of lien against the charterers and the cargo interests will depend upon the lien clauses in the charterparty, in the bill of lading and the incorporation clause in the bill of lading. A shipowner can also, in principle, exercise a possessory lien over the cargo by refusing to discharge the same in the event that the party liable to pay the shipowners dues is the owner of the cargo. The exercise of a possessory lien over cargo owned by third-party cargo interests may potentially expose the vessel to claims under the bills of lading contract. In the case of British India Steam Navigation Co Ltd v. Shanmughavilas Cashew Industries ,43 the Supreme Court of India expressed the opinion that a consignee or an endorsee may be bound by the terms of the charterparty terms incorporated into the bill of lading contract even in circumstances when the consignee or endorsee is unaware of those terms. The Bombay High Court, in its recent judgment in the case of M/s. Assobhai Bhanji and Sons v. Great Circle Shipping Pvt. Ltd,44 allowed a shipper’s claim against a carrier for delivering cargo without production of the bill of lading even in circumstances when the bill of lading has been made out ‘to the order of a named consignee’. Carriers can limit their liability for cargo claims by way of ‘package limitation’ and ‘kilo limitation’ pursuant to the Indian COGSA and the Multimodal Transportation Act 1993. A party seeking to limit liability under the LLMC Convention 1976 can initiate limitation proceedings by filing an admiralty suit in the High Court. 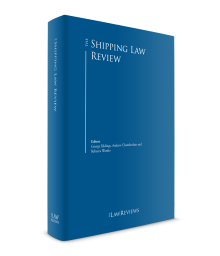 Section 352(b) contained in Part XA of the MSA provides that ‘the Convention on Limitation of Liability for Maritime Claims 1976 as amended from time to time’ has the force of law in India. The Merchant Shipping (Limitation of Liability for Maritime Claims) Amendment Rules, 2015, which came into force on 16 February 2015, gives effect to the 1996 Protocol of the 1976 LLMC. Under the 2015 Rules, a different unit of account applies to ‘Indian ships intended for navigation in or around the coast of India’ than to foreign-going vessels. The Merchant Shipping (Limitation of Liability for Maritime Claims) Amendment Rules, 2017, which came into force on 21 February 2017, gave effect to the 2012 amendments to the 1976 LLMC. However, the 2017 Rules do not apply to coastal trade. This would imply Indian-flagged vessels having a licence only to trade along the coast of India would follow the 1996 Protocol to the 1976 LLMC, whereas seagoing vessels would follow the 2012 Amendments to the 1976 LLMC. The amended rates are applicable to incidents that take place subsequent to the amendment coming into force. The High Court of Bombay held that a shipowner’s right to limit liability under Part XA of the MSA is absolute and without reference to any proof of loss resulting from a personal act or omission of the shipowner.51 This decision is therefore likely to make India a favourable jurisdiction for constituting a single worldwide limitation fund, without any prior claim being initiated. Interim limitation funds are not permissible under Indian law. The CLC Convention, as amended from time to time, has been incorporated under Part XB of the MSA. A party seeking to limit liability can file an action in the admiralty court.52 Security in the form of cash or bank guarantee is permissible. a defined time period of one year after which maritime liens would expire, except for seafarers’ wages, which expires after two years. the Admiralty Act is silent on whether property other than ships, such as bunkers, cargo, freight, is amenable to an order of arrest outwith a vessel. The Bombay High Court in the case of Flag Mersinidi 53 rejected the notion that a maritime lien can be carpeted by a bunker supply contract, if the governing law of the bunker supply contract recognises a maritime lien for bunkers supplied to a vessel. The Court had refused to apply American law, which was the governing law of the bunker supply contract and applied Indian law as the lex fori. The Supreme Court of India held that a claim for necessaries supplied to a vessel would constitute a maritime claim against a vessel and not a maritime lien.54 The judgment further stated that ‘arrest of a foreign ship for a maritime claim is permissible only if there is no change of ownership between the date of claim and date of arrest’. The arrest of cargo outwith a ship is not permitted by the Bombay High Court,70 albeit certain other High Courts have allowed the same on occasions. India is a party to the Indian Ocean MOU, which lays down basic standards for vessels calling at ports. In order to prevent wreckage of older foreign ships in Indian waters, as well as prevent oil spills, the Ministry of Shipping has notified the Merchant Shipping (Regulation of Entry of Ships into Ports, Anchorages and Offshore Facilities) Rules 2012, which, inter alia, provide that foreign-flagged vessels can only enter Indian territorial waters on being in possession of a Blue Card (i.e., valid insurance cover) and only if they are registered with a classification society that is a member of the International Association of Classification Societies. Indian-flagged vessels will be registered under the MSA, the Inland Vessels Act 1917 or the Coasting Vessels Act 1838, depending on the nature and type of vessel. The Customs Act 1962 imposes various obligations upon owners of vessels calling at ports in India, such as the Import General Manifest. A central register is maintained by the DG Shipping, which contains all the entries recorded in the registers kept by the registrar at the port of registry in India. Any vessel that is registered requires a licence to trade. Vessels that are more than 25 years old require a special licence to trade. India is the second-highest contributor to the IOPC Fund in the world, with 13.12 per cent of the total composition of the fund. The IOPC Fund is under an obligation to pay compensation to states and persons who suffer pollution damage, if those persons are unable to obtain compensation from the owner of the ship from which the oil escaped or if the compensation due from the shipowner and P&I club is not sufficient to cover the damage suffered. The COLREGs have been incorporated into Indian law under the Merchant Shipping (Prevention of Collisions at Sea) Regulations 1975. While, in principle, Indian courts have the power to apportion liability between two vessels in accordance with the degree of fault, there have been very few instances when they have proceeded to apportion liability. There is no precise formula to measure the degree of negligence of a party under Indian law and the courts have a considerable amount of discretion based on abstract notions of justice and equity.77 Section 345(1)(a) of the MSA provides that in an event where it is not possible to establish different degrees of fault, the liability shall be apportioned equally. In these circumstances, liability between two vessels in a collision would be apportioned equally unless it is ex facie evident that the degree of fault of one vessel was palpably higher than the other. The law in India with respect to shipwrecks is laid down in Part XIII of the MSA and in the Indian Ports Act 1908. The term ‘wreck’ includes ‘a vessel abandoned without hope or intention of recovery’. India is in the process of giving effect to the Nairobi WRC 2007 into domestic law, but at present there is no legal regime to deal with the removal of wrecks in the exclusive economic zone of India. In the case of Oil & Natural Gas Corporation Ltd v. Osprey Underwriting Agencies Ltd,78 the Bombay High Court, in interpreting Section 14 of the Indian Ports Act, directed a foreign P&I club and its Indian agents to deposit the cost of removing and raising the wreck in the Indian court. However, it should be noted that the Bombay High Court, inter alia, dealt with a dispute between the assured and the P&I club. Sections 402 to 404 of the MSA provide the salvor withthe right to claim salvage services. The Kerala High Court, in the case of Commander KP Shashidharan v. Union of India,79 allowed an officer of the Indian Coast Guard to claim salvage services even though he had a pre-existing duty to protect life and property at sea. India has ratified the Maritime Labour Convention 2006 (MLC) and made amendments to the MSA to give effect to the provisions of the MLC. In the exercise of the powers conferred by Section 218A read with Section 457 of the MSA, the Indian government promulgated the Merchant Shipping (Maritime Labour) Rules, 2016 (MLC Rules), which, inter alia, cast an obligation on a vessel’s financial security provider for unpaid wages for up to a maximum period of 120 days and repatriation expenses in the case of abandonment by the shipowner. The Supreme Court of India held that a foreign seafarer’s right to wages falls within the ambit of a fundamental right to life and liberty under Article 21 of the Constitution of India.80 Indian courts are likely to be guided by the general standard agreement between the National Union of Seafarers of India and the Indian National Shipowners’ Association, as an overwhelming majority of contracts of employment on board a vessel incorporate these terms. Indian law recognises the rights of an injured seafarer or the family members of a deceased seafarer to claim compensation for injury or death of the seafarer. The Employees’ Compensation Act 1923 (ECA) is a general legislation that allows workmen or employees to claim compensation for death and personal injury of seafarers. However, the ECA would not apply to Indian seafarers working aboard foreign-flagged vessels. Under Indian law, foreign seafarers cannot be employed on Indian-flagged vessels unless they obtain prior permission from the DG Shipping. The law relating to corporate insolvencies in India has undergone a paradigm shift with the enactment of the Insolvency and Bankruptcy Code, 2016 (Insolvency Code). The Insolvency Code recognises the ‘creditor in possession’ model and differs from jurisdictions that follow the ‘debtor in possession’ model, such as Singapore and the United States. The moment the National Company Law Tribunal admits an insolvency petition, an insolvency practitioner gets appointed to take over the management of the company. A committee of creditors is formed, comprising the financial creditors of the company, who then have a period of 180 days (extendable by up to 270 days) to finalise a corporate rescue strategy, known as an ‘insolvency resolution plan’, failing which the company would automatically be put into liquidation. The notorious Sick Industrial Companies (Special Provisions) Act, 1985 and various provisions of the Companies Act, 2013 have been repealed. The Insolvency Code stipulates definitive time periods within which various stages of the insolvency, corporate rescue and liquidation proceedings have to be completed. Indian maritime and commercial laws have undergone substantial changes with the enactment of a plethora of legislation and amendments in areas such as arbitration, admiralty, insolvency and tax. Moreover, the Merchant Shipping Bill 2016 is currently pending before Parliament, which would also update the regime under the MSA. This legislation comes as a welcome development in bringing the Indian legal and regulatory environment up to speed with legislative developments in other countries. It is also heartening to note that India jumped 30 places from its ranking last year in the ‘Ease of doing business rankings’ published by the World Bank in Doing Business 2018, to 100. Notwithstanding the foregoing, it remains to be seen how stakeholders react to the entire gamut of legislations affecting the shipping industry. 1 Amitava Majumdar (Raja) is the managing partner, Aditya Krishnamurthy is a partner, and Pranoy Kottaram and Arjun Mital are senior associates at Bose & Mitra & Co.
2 Dudnik Valentyn and Ors. v. The Inspector of Police, ‘Q’ Branch CID, Crl. A. (MD) Nos. 41, 43, 44 of 2016. 3 Vide Order No. 2 of 2012 (48-NT(1)/2012). 4 Section 406 of the MSA. 5 Vide General Order No. SW-15011/8/2015-CS dated 7 March 2016. 6 Swastik Gasses P Ltd v. Indian Oil Corporation Ltd (2013) 9 SCC 32. 7 Section 20 of the Code of Civil Procedure 1908 (CPC). 8 AsBC Laminart Pvt Ltd v. AP Agencies Salem (1989) 2 SCC 163. 9 Modi Entertainment Network and Anr v. WSG Cricket Pte Ltd, AIR 2003 SC 1177. 10 Section 23 of the Indian Contract Act 1862. 11 Hari Shanker Jain v. Sonia Gandhi, AIR 2001 SC 3689. 12 Malaysian International Trading Corpn v. Mega Safe Deposit Vaults (P) Ltd, 2006 (3) Bom C R 109. 13 Section 28 of the Indian Contract Act 1872. 14 The Fifth and Seventh Schedules of the Arbitration Act. 15 Section 36(2) of the Arbitration Act. 16 Section 45 of the Arbitration and Conciliation Act 1996. 17 (2013) 1 SCC 641. 18 MSM Satellite v. World Sport Group (2014) 1 SCC 58. 19 GMR Energy Limited v. Doosan Power Systems India Pvt. Ltd, 2017 SCC OnLine Del 11625. 21 2017 (5) ArbLR 112 (Delhi). 22 Bharat Aluminium Co v. Kaiser Aluminium Technical Services (2012) 9 SCC 552. 23 Fuerst Day Lawson Ltd v. Jindal Exports Ltd (2001) 6 SCC 356. 24 Oil and Natural Gas Corporation v. Western Geco International Ltd (2014) 9 SCC 263 and Associate Builders v. Delhi Development Authority (2015) 3 SCC 49. 25 Intesa Sanpaolo SPA v. Videocon Industries Ltd, 2014 SCC Online Bom. 1276. 26 Mitsui OSK Lines Ltd (Japan) v. Orient Ship Agency Pvt Ltd (India), Arbitration Petition No. 842 of 2009 and Aurelia Reederei Eugen Friederich GmbH v. POL India Projects Limited, Arbitration Petition 12 of 2012. 27 To date, only 11 countries have been notified as reciprocating territories by the Indian government: Aden, Bangladesh, the Cook Islands, Fiji, the Federation of Malaysia, Hong Kong, New Zealand, New Guinea, the Republic of Singapore, Trinidad and Tobago, the Trust Territories of Western Samoa, Papua, the United Kingdom and the United Arab Emirates. 28 International Woollen Mills v. Standard Wool (UK) Ltd, AIR 2001 SC 2134. 29 Civil Application (OJ) No. 250 of 2015. 30 2007 (3) ARBLR 46 Delhi. 31 Company Petition No. 67 of 2013. 32 Tiruvenibai v. Lilabai, AIR 1959 S.C. 620. 33 Base International Holdings NV Hockenrode 6 v. Pallava Hotels Corporation Ltd, 1999 PTC (19) 252. 34 Consolidated Coffee Ltd v. Coffee Board, Bangalore (1980) 3 SCC 358. 35 (2008) 2 SCC 79. 36 Collis Line Private Ltd v. New India Assurance Co Ltd, AIR 1982 Ker 127. 37 Fateh Chand v. Balkishan Dass, AIR 1963 S.C. 1405; and Oil & Natural Gas Corporation Ltd v. Saw Pipes Ltd, 2003(5) SCC 705. 38 Section 60 of the Major Port Trust Act 1963. 39 Section 48 of the Gujarat Maritime Board Act. 40 (2014) 2 MLJ 154. 41 Misc. Civil Application No. 187 of 2003 in Admiralty Suit No. 14 of 2003. 42 MV ‘Baltic Confidence’ v. The State Trading Corporation of India Ltd (2001) 7 SCC 473. 43 (1990) 3 SCC 48. 44 (2018) 2 AIR Bom R 252. However, this judgment is pending appeal. 45 Forasol v. Oil & Natural Gas Commission, 1984 SCR (1) 526; and Forysthe Trading Services Ltd v. MV ‘Niizuru’, 2004 (5) Bom CR 806. 46 Section 34 of the Code of Civil Procedure, 1908. 47 Section 31(7)(b) of the Indian Arbitration and Conciliation Act 1996. 48 Steel Authority of India Ltd. v. Pacific Gulf Shipping Co. Ltd, Appeal No. 391 of 2013. 49 2004 (5) Bom CR 806. 50 Hyder Consulting Ltd v. State of Orissa (2015) 2 SCC 189. 51 Murmansk Shipping Company v. Adanin Power Rajasthan Ltd & Ors, Admiralty Suit No. 43 of 2012 (decided on 8 January 2016). 52 For an Indian-registered ship, in the High Court of the state in whose port the vessel is registered, or where the incident occurs. For foreign ships, at the port or place within the territorial waters of which the vessel is present. 53 Notice of Motion No. 763 Pf 2013 and Admiralty Suit No. 8 of 2013. 54 Chrisomar Corporation v. MJR Steels Private Ltd, 2017 SCC OnLine SC 1104. 55  1 Lloyd’s Rep 37. 56 Videsh Sanchar Nigam Limited v. MV ‘Kapitan Kud’ (1996) 7 SCC 127. 58 Security can be deposited in US dollars in the Bombay High Court. 59 Stephen Commerce Pvt Ltd v. Owners and Parties in Vessel MT ‘Zaima Navard’, AIR 1999 Cal 64. However, the parties can agree to an LOU as security, which could be accepted by the courts. 60 Lufeng Shipping Company Ltd v. MV ‘Rainbow Ace’, 2013 (4) ABR1412. 61 Universal Marine & Anr v. MT ‘Hartati’, MANU/MH/0131/2014. 62 Order VI Rule 4, Civil Procedure Code 1906. 63 Rushab Ship International LLC v. The Bunkers on board MV African Eagle, 2014(4) Bom CR 269. 64 Sunil B. Naik v. Geowave Commander, 2018 SCC OnLine SC 203. 65 Gulf Petrochem Energy Pvt Ltd v. MT ‘Valor’ in Notice of Motion (L) No. 581 of 2015 in Admiralty Suit (L) No. 94 of 2015 and Drop Energy Services Ltd v. MT ‘Tradewind’ in Notice of Motion No. 805 of 2015 in Admiralty Suit No. 240 of 2015. The former judgment is under appeal to a higher bench of the Bombay High Court. 67 Lufeng Shipping Co Ltd v. MV ‘Rainbow Ace’ and Ors, Notice of Motion No. 1646 of 2013 in Admiralty Suit No. 29 of 2013. 68 Peninsula Petroleum Ltd v. Bunkers on board the vessel MV ‘Geowave Commander’, Notice of Motion No. 385 of 2014 in Admiralty Suit No. 85 of 2014. 69 Bulk Shipping Management SEA & Anr v. The Bunkers on board MV ‘African Eagle’, 2013 (3) BomCR 380. 70 Global Integrated Bulkers Pte Ltd. v. Cargo of 14,072.337 MTS of Limestone (Judge’s Order No. 253 of 2017 in Comm. Admiralty Suit (L) No. 665 of 2017. 72 Coromandel International Limited v. MV ‘Glory I’ and Andromeda Ship Holdings Ltd, 2014 (3) ABR 365. 74 Navbharat International Ltd v. Cargo on board MV ‘Amtees’, MANU/MH/0192/2014. 75 M/s. Greenwich Meridian Logistics (India) Pvt Ltd v. M/s. Sapphire Kitchenware Pvt. Ltd, Admiralty Suit 31 of 2008 of Bombay High Court and MUR Shipping BV Amsterdam v. Al Gyas Exports Private Ltd.
76 Section 352I(4) of the MSA. 77 Municipal Corporation of Greater Bombay v. Laxman Iyer 2003(8) SCC 731. 78 1998 (2) BOMLR 179. 79 AIR 2002 Ker 388. 80 O Konavalov v. Commander, Coast Guard Region (2006) 4 SCC 620.